As Barry Podob mentioned in the previous blog, more people than ever are working from home. He mentions that it’s great for work-life balance among other benefits, but makes sales presentations a bit more difficult than they used to be. Read his entry for the details. I am part of this remote workforce. Since December 2015, my employer – L.E. Hotels – decentralized our offices at the Luxe Sunset Boulevard Hotel to create more meeting space. I must say I love it. And by love I mean the working-from-home part as well as the new meeting spaces at the hotel.1 As we were on property, to blend in with the rest of the hotel staff (and honestly, in fairness to them) we also dressed in full “hotel formal” – suits and ties for the men and dresses or suits for the ladies. I understood why, but still, I was in a windowless office on the phone or emailing. Lots of dry-cleaned suits and interesting ties and no one to notice but co-workers in the lunch room. Working from home included not only giving up weekly bags of dry-cleaning, but the commute. I lived downtown and commuted to Westwood, losing 2 ½ hours a day in the car. That said I rediscovered my love of audio books and podcasts. Did you know the Economist magazine is available in audio format? I never missed an article. Now that I telecommute, I’ve completely lost track of the Economist and have no idea what Sandra Tsing Loh is up to.2 My commute now is about 10 seconds from coffee maker to home-office. I’ve found that laundry can be switched between washer and dryer in the amount of time you would normally need to walk away from your desk anyway. Same goes for the dishwasher. But when there’s lots to be done around the house (a mountain of laundry, dusting, vacuuming, or a full-on kitchen/bathroom scrub-down) I need to escape, or it would distract and haunt me from the back of my mind. For months, my escape would be Starbucks, or a few cool independent coffee places with fast WiFi.3 After moving to back to the Valley in 2016, I discovered the Muse Rooms. If you’ve seen anything about the coworking space movement, it’s amazing. If you are unfamiliar, it’s shared office space with other people from any imaginable industry. Generally, they feature open areas with desks to use on a first-come, first-served basis. For a little more you can get a dedicated desk, and for a bit more than that, a small private office, up to larger rooms for 4, 6 or more people. The Muse Rooms has accountants, social media specialists, writers, filmmakers, and me, the “hotel guy”. I get the benefit of having “coworkers”, people to have lunch with, or to bounce around ideas. It also costs less than my former monthly Starbucks bill. The Muse rooms and other coworking spaces typically offer free WiFi, snacks and - you guessed it – coffee. I found, or as Ms. Kingsford would prefer, I am “creating” my work-life balance in 3 phases. The first was luck that I happened to work for L.E. Hotels where the forward-thinking leadership decided to “go virtual”. This was a gift of almost 3 hours a day to me. Immediately I became a more efficient team member and morale increased. The second was the decision to sign up for a coworking space. I visited a few but found one with the atmosphere and “vibe” where I felt most comfortable. A place to get away from the distractions of home, but within a quick and easy drive, well within my budget. The third phase is in progress and the one I’ve had the most trouble with. A few years ago, I had a conversation with a friend who likes to make things in his spare time – art and objects from painting, to creations made of wood, metal, or styrofoam. We discussed the human need to make something. I thought about this a lot. Many sales people in hospitality and other industries do a lot of what I like to call “slinging electrons” – in the form of emails and phone calls. We don’t make a product out of wood or metal, but we bridge clients and guests to the hotel room. We may very well put in 8 or more hours, and we may be very passionate about it, but we go home with our hands empty. The emails, phone calls, and meetings aren’t tangible things. I believe therein lies the key to work-life balance. Referring back to the opening quote, “Balance is not something you find, it’s something you create.” It may not be handed to you in the form of working from home or setting your own schedule at a local shared office. But the last word of that sentence, “create”, is something all of us must make time to do. I’m very bad at this but as I learn and grow I also encourage you to create your balance. Find a secondary passion (or a first if it isn’t hotels and travel) and create it. While writing isn’t much more tangible than emails or phone calls, it’s something I enjoy and is becoming more of my own creative outlet. I believe acting, singing, and other intangibles that we create count too! And another thing - if we have a hobby that uses our creative energy (anything from acting to sculpture) it can be the catalyst to more passion in our careers. Imagine increased room-nights via a pottery class, a higher ADR through karaoke, new corporate accounts via gardening. Passion in one area can generate passion in another. In conclusion, if you’re lucky enough to work from home, don’t waste any of the extra time you’ve been gifted. If you work from home and are easily distracted, find a coworking space or a coworking buddy. And whether you set your own schedule or not, use what time you may have to do something you truly enjoy. All areas of our lives can benefit from creative outlets. You never know what life and career enhancing discoveries lie ahead! 1 Visit www.lehotels.com for more information and www.luxehotels.com/sunset to check out the meeting space. 2 Check out Sandra Tsing Loh’s podcasts, The Loh Down on Science and The Loh Life, and let me know! 3 Coffee Shop working - I highly recommend Mega Bodega a block south of the Ace Hotel in Downtown L.A., or Coffee Commissary in Burbank. I got into the hotel business 15 years ago. I used to make four sales calls a week, sometimes five. Lately, I make one or two a month. An exception is when I travel. I visit New York three or four times a year. I’ll fly in on a Sunday; schedule sales calls Monday through Thursday and visit 20 to 25 agencies and clients. I’m headed to London shortly for four days of calls. I’ll see 16 agencies, clients and prospects. Then it’s off to San Francisco for two days of calls to about 8 agencies. The big difference is, while I’ll make a lot of calls, I won’t see a lot of people. I’ll visit the heads of the agency or the key decision makers – but I won’t see the rank and file – the agents who actually make the bookings. What’s changed? Telecommuting. Working remotely. Working from home or, for lots of millennials, working from Starbucks. WiFi, laptops, tablets, smartphones and notebooks changed the way we work. For many, these tools made the commute a short walk from the bedroom to the home-office. It changed the traditional 9:00 to 5:00 work day to pretty much working any time of the day. It eliminated sitting in a cubicle for hours. It allowed people to save gas money, commuting time, not having to buy professional clothing, not paying for dry cleaning and in many instances, to save on child care expenses. In addition, those who telecommute realize tax advantages from being able to deduct home office expenses. And there are benefits to employers. Companies save thousands on office space, energy and parking. There’s increased productivity from minimal socializing and employees have less stress. There’s also a reduction in absenteeism. Instead of taking a personal day, telecommuters work in bad weather or when children are home sick, or during school closings. There are so many pluses and telecommuting is so commonplace that the number of employees who are, or who have, at one point in their careers, worked at least one day a month from home has grown by more than 300 percent in the past 20 years. Mickey Weill, who many of you know and who handles Protravel’s Sales and Marketing efforts for the West Coast, tells me that roughly 50% of their 900 nationwide employees work at home and, for their Beverly Hills and Encino Offices, the number is closer to 60%. David Sefton, who is responsible Altour’s West Coast Operations, says that roughly 30% to 40% of his agents work from home and that number is growing. I haven’t reached out to Tzell, Frosch, New Act or others but there’s no doubt that the numbers will be the same. All in all, it looks like telecommuting benefits everyone – everyone that is except hoteliers who want to see travel agents to explain the features and benefits of our properties, to thank them for their bookings and to stay front of mind. That’s why trade shows like this one, Jody Flowers’ L.A. Trade Show, and the one she holds in New York, are so important. It gives us the opportunity to reach those we might not otherwise see. I did a quick search on Google for “Travel Trade Shows.” One website listed 161; another had 86 and a third, 120. As a hotelier, it’s important that we pick and choose to attend shows that are the most worthwhile, those that give us the greatest exposure and at the same time, those that let us connect with the right audience. Notwithstanding trade shows, hotel events are key. Earlier this month, my hotel, Le Parc, held its 10th Annual Pre-Tour Connection Rooftop Event. We had over 200 persons on hand and you can be sure that my staff showed rooms to many of them. FAMs – travel agent “familiarization trips,” where groups of agents stay at the hotel, and while expensive, are also critical to exposing the property to those that will book it. For a small, independent hotel such as ours, we usually leave the details to our Marketing and Visitors Bureau who organizes these on behalf of our hotel and others in the area. 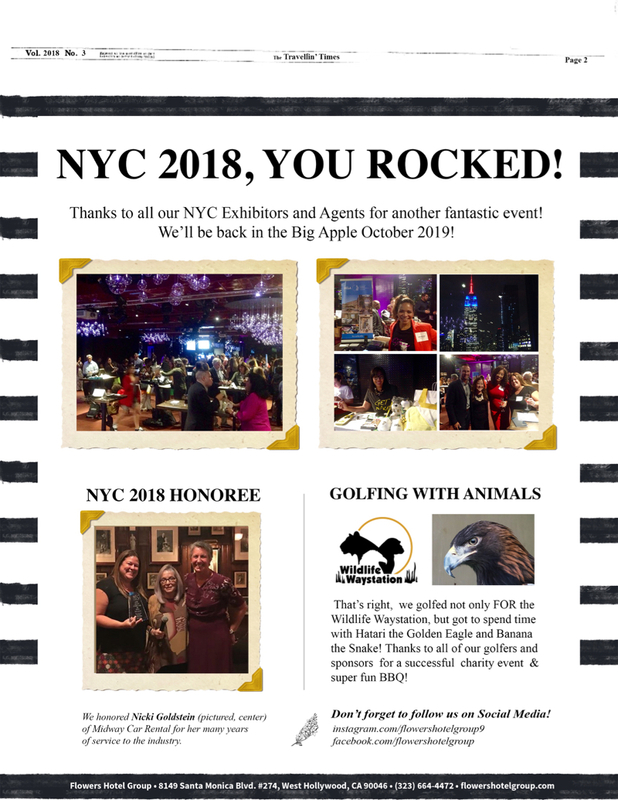 We also rely on our Marketing and Visitors Bureau to host “client events” –we call them “Travel Appreciation Events” we hold them in our big markets: L.A., New York, London and sometimes other geographic areas, such as Australia. 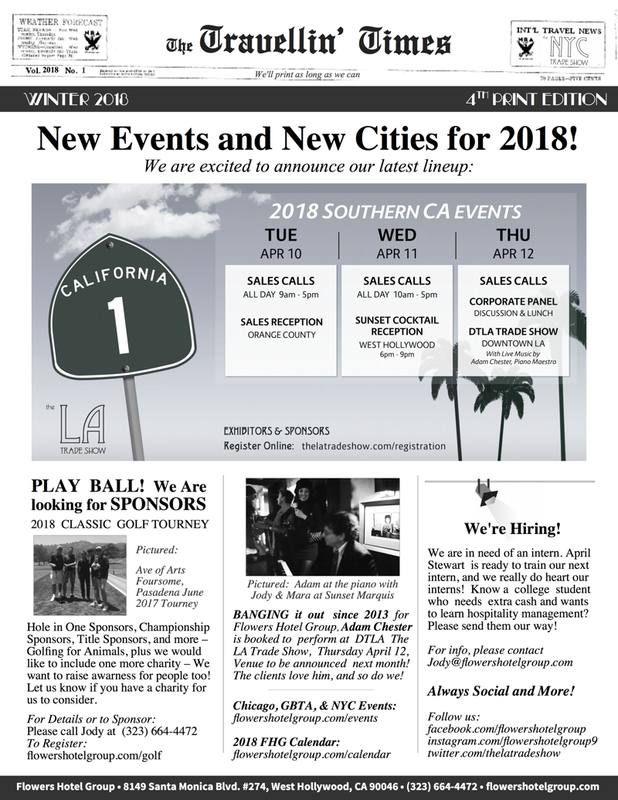 The WeHo Marketing Bureau’s Director of Sales and Marketing reaches out to each of the 17 hotels in our area and asks that we to submit a list of 40 to 70 clients we’d like to invite. Duplicates are eliminated and when all is said and done, we get the exposure that we need. So, just because we don’t see everyone when we visit – there are ways to see those we want to when we want to. Let’s move on. 2. We Didn’t Sell Out for Grammy’s or Gay Pride – What’s Different? When I got into the hotel business, telephone revenue was a robust source of income. So were in-room movies. Cell phones and laptops changed that. The vast majority of Americans – 95% – own a cellphone and they all use them in the hotel. And there aren’t many hotels that don’t provide WiFi and guests aren’t just using it to check Facebook and Twitter. They’re watching movies and playing games which hotels once offered, for a fee, on their in-room TVs. Now the onslaught is on parking. Here in L.A., Uber accounted for 43% of all ground transportation surpassing car rentals for the first time. Car rentals are down by 15% and the number is growing. If people aren’t renting cars, they’re not parking them and, if they’re not parking them, ancillary hotel revenue is hurting. What’s next? It’s “Alternative Lodging” – “Peer to Peer” Lodging and that means Airbnb. Airbnb provides a marketplace for people to list their rental properties and for travelers to search for rooms. Their platform has 3 million listings in 65,000 cities in close to 200 countries. They don’t own lodging but make money by charging guests a 6% to 12% fee and hosts a 3% host fee. It’s less than eight years old and has caused massive changes in the way people travel. An example was at last year's Super Bowl. Some 15,000 people booked Airbnb rentals in the Bay Area and that was four times more than for the previous game in Phoenix. Who uses it? It’s hard to nail down demographics but it’s just about anyone – its travelers looking for lower cost rentals. It’s younger travelers, it’s families who need more space than a traditional hotel room can offer; leisure travelers who are OK without daily housekeeping and increasingly, business travelers. Airbnb has 50,000 businesses using its platform. And their “Airbnb for Business” website gives business travelers access to more than 2 million homes around the world. What’s the advantage? Hosts make extra money and travelers can stay for less than the cost of a hotel room. In spite of the benefits however, there are concerns. Hosts face the risk that their property will get damaged and, while most transactions occur without incident, there are stories of entire houses being trashed by dozens of party-goers when the Airbnb hosts thought they were renting to a quiet suburban family. Guests run into trouble when the property doesn’t match the description or that the host is unresponsive to guest needs. And it goes without saying that not only do Airbnbs take travel agents out of the loop and that means lost commissions, it has drastic financial implications for the hotel industry. In January 2016, a report issued by the New York City Hotel Association stated that in 2015, it cost the lodging industry $450 million in revenue and $225 million in lost tax revenue and the numbers are growing. Here in Los Angeles, it was illegal for someone to rent a unit for less than 30 days unless that unit was zoned for use as a hotel or bed and breakfast. That changed last June when the City Council legalized short-term rentals allowing people to rent their primary residence or rooms within that residence up to a maximum of 180 days per year. Anyone who wants to rent their home on a short-term basis has to register with the city, pay a registration fee and pay a business tax and an occupancy tax with Airbnb being forced to ask would-be renters for their registration number. That led the way for a surge in listings. There are some 20,000 properties on Airbnb inside the city of Los Angeles for rent. Just like cellphones, Uber and Lyft, Airbnb’s aren’t going away anytime soon. I conducted an informal survey of some hoteliers to see if they were thinking of listing rooms on Airbnb. Those I talked with aren’t there yet even though there are no restrictions. But in a December 2015 article, Fast & Company reported that some boutique hotels already are. They use the platform the same way they use booking services like Expedia and Priceline, but at a lower cost. And lastly, Expedia, which in the last year and a half acquired Travelocity and Orbitz purchased Airbnb’s competitor, Homeaway, a vacation rental site, for $3.9 billion. Clearly food for thought. If you walked the streets of Beverly Hills last summer, you couldn’t help notice an abundance of Middle Eastern Tourists. They were along “The Golden Triangle” shaped by Santa Monica Blvd., Wilshire Blvd. and Canon Drive, and they were on Rodeo Drive the most famous and expensive shopping district in America. And during the six weeks in July and August that made up the Arab Post-Ramadan Holiday, the luxury hotels in and along The “Golden Triangle were fully booked. Because the Regent Beverly Wilshire, the Montage, the Peninsula and the Beverly Hills Hotel were fully committed, Middle Eastern travelers could be found at our hotel and others in West Hollywood driving occupancy on lots of days to 100%. That was last year. This year things will be different. We have a President who seems to have forgotten that his name is on the outside of a collection of five-star hotels in New York, Washington, Miami, Chicago, Vegas and some international locations as well. He issued Executive Order 13769. Its title is “Protecting the Nation from Foreign Terrorist Entry into the United States.” The intent was to keep refugees and immigrants from seven predominantly Muslim nations from coming into the country and, as we all saw on television, the ban snared green card holders, people with valid visas and travelers who were in the air when Trump signed the order. Some were detained and others sent back to where they flew in from. Lawsuits began to fly and although a federal judge temporarily blocked the order, a modified order was and is currently in the courts. The reality is that the seven countries named in the ban generate so few incoming travelers to the United States – less than a tenth of a percent – that no U.S.-based airline has direct flights. But it is an atmosphere of fear that’s scaring people off who have the slightest connection to the Muslim world. A perfect example is The Toronto Star Newspaper. In late January they published a commentary calling on Canadians to forgo travel to the U.S. until Trump is out of office. Fallout affected a tour operator called “Comfort Tour” who, during Spring Break, brings 200 to 300 Canadian families to New York to see the Statue of Liberty, Rockefeller Center and other attractions. Springtime is the start of their busy season. This year, instead of 200 to 300 travelers who usually make the trip, only 11 chose to do so. People are afraid to cross the border. That’s only one small example. But the fallout from the ban has wide-ranging implications for our industry. There’s a company in Wayne, Pennsylvania called Tourism Economics that reports on travel activity. According to them, we’ll see 4.3 million fewer international visitors in the U.S. this year. That translates into $7.4 billion of lost revenue. In New York – which is the nation’s most visited city by overseas travelers and which attracts almost 30% of the all foreign visitors in the U.S., 300,000 less tourists will visit this year which translates to $900 million in revenue. Here in Los Angeles, the Tourism and Convention Board suggests that we may see as many as 800,000 fewer international visitors over the next three and lose $736 million in spending. And bear in mind, it’s not just the Executive Order that will impact travel - it’s the president’s “America First” rhetoric, it’s trade protectionism, it’s the Mexican wall and it’s people worrying if their cellphone will be searched as they try to enter the country. The challenge is how to make up the potential lost revenue? It’s critical that our marketing arms, Visit California, the L.A. Tourism and Convention Board and our local visitor bureaus redouble marketing efforts that target potential visitors – both domestic and international – and continue to sell travel to L.A. no differently than when travel suffered in the past - after the U.S. went to war with Iraq and after the worldwide recession in 2008 brought on by subprime mortgage defaults. As hoteliers need to need to explore every avenue that will drive business. Take a look at the Market Plan that’s sitting on the shelf gathering dust and work your way through every strategy you outlined. Implement those promotions that encourage travel from drive markets; go after more meetings and events; seek group bookings; look at the OTAs and opaque sites in a new light; explore web marketing opportunities including GDS and banner advertising;’ form alliances with tour and travel operators who book international locations that are still friendly to the U.S. and above all, don’t let a room go unsold and sit vacant for any evening. I’ve been living in Los Angeles for 20 years. When I first got here I was told Des Moines, Iowa had more annual city-wide conventions than L.A.
Cvent is a company that has software that allows hoteliers to bid on group business. They report that Orlando is the top convention city in the country followed by Washington, DC, Las Vegas, Miami, Chicago, San Diego, and a host of other cities. Los Angeles comes in at number 17. Los Angeles has Disneyland; Harry Potter; Hollywood, the Dodgers, concert venues, tourist attractions, shopping, beaches, restaurants and night life. And now we have two football teams: the Rams and the Chargers and a stadium that will be built. And, of course, L.A. has great weather. Orlando has humidity. Washington D.C. has politics; Las Vegas has, well, Las Vegas. Need I go on? Los Angeles has great weather. When I asked why we didn’t have more city-wide conventions, I was told there weren’t enough hotel rooms. As of last July, Los Angeles gave travelers a choice of over 98,000 hotel rooms at over 1,000 properties. It’s not as many as New York or Chicago, but we’re the fifth largest market in the U.S. And a lot has changed, particularly the landscape. The Dream Hollywood Hotel - a 179 room hotel with an 11,000-square-foot rooftop lounge area and five food-outlets. The Freehand Hotel, a 226 room hotel with a rooftop pool. The James Los Angeles on Sunset Blvd., which has 286 rooms, two restaurants, a rooftop bar and about 10,000 square feet of meeting space. The Hotel Indigo, an 18-story, 350-room Inter-Continental Hotel. The Wilshire Grand, a 900-room hotel with a “sky lobby” on the 70th floor and the tallest building west of the Mississippi. The Waldorf Astoria in Beverly Hills with 170 rooms. Ian Schrager’s Edition Hotel, a Marriott Brand, with 190 rooms and two rooftop pools. First, demand is robust due to strong job growth and new companies moving to L.A.
Second, for the sixth year in a row, L.A. saw a record number of annual visitors to the city. The L.A. hotel market recorded an 81% occupancy rate combined with an increase of 8.5% in room rates. This growth has made hotel companies bullish on new construction. Third, inflation and interest rates are low. This is allowing builders to secure reasonable financing. Fourth, it’s cool to be downtown. It all started when the Staples Center, home to the NBA’s Los Angeles Lakers and Clippers, the NHL’s Kings and the WNBA’s Sparks opened followed by the Nokia Theatre which is now the Microsoft Theatre. People began to rediscover downtown and new restaurants and housing entered the marketplace, which in turn led to hotel construction. And back in November, the L.A. Rams broke ground on their new $2.66 billion stadium in Englewood. It will seat 80,000 for football, 100,000 for concerts, be located at the heart of the new “City of Champions” district, a mixed-use, entertainment, and leisure neighborhood being constructed on the site of the recently-demolished Hollywood Park fairgrounds and, when it is completed in time for the 2019-2020 NFL season, the Chargers are expected to play there as well. Fifth, the City is pushing for more hotel construction near the Convention Center so that the CVB can attract more of that group and meeting business along with a bid for the 2024 Olympics. Sixth, private equity firms, offshore investors and real estate investment trusts need a place to park their money. There is however, concern that in the short run there will be an oversupply of hotel rooms. In West Hollywood, where Le Parc is located, there are 2,058 hotel rooms. That number will grow by 539 this year and next. That’s a 62 percent increase and raised the specter of the potential for too many rooms and not enough guests. So that brings me back to not enough conventions. What’s being done? Two things: first the city turned management of the Convention Center to a division of AEG, the entertainment group that owns and operates the adjacent Staples Center and L.A. Live, and they’re upbeat about bringing in new business. Second, there are proposals to upgrade and expand the current 870,000-square-foot convention facility to 1.3 million square feet, including 60,000 square feet of ballroom space. This should make it easier to attract the kind of large conventions that typically go to other cities. As you can see, the world in which we live – the L.A. Travel Landscape – has changed exponentially in just the last five years. It’s continually changing. Rapid technological advances in communication, transportation, lodging and the political climate have made it so much easier to be in touch with each other, sometimes at the speed of light, but a downside is that it’s made it harder to interact. Client interaction and relationships are the cornerstone of any successful sales strategy – and every successful Sales Person. 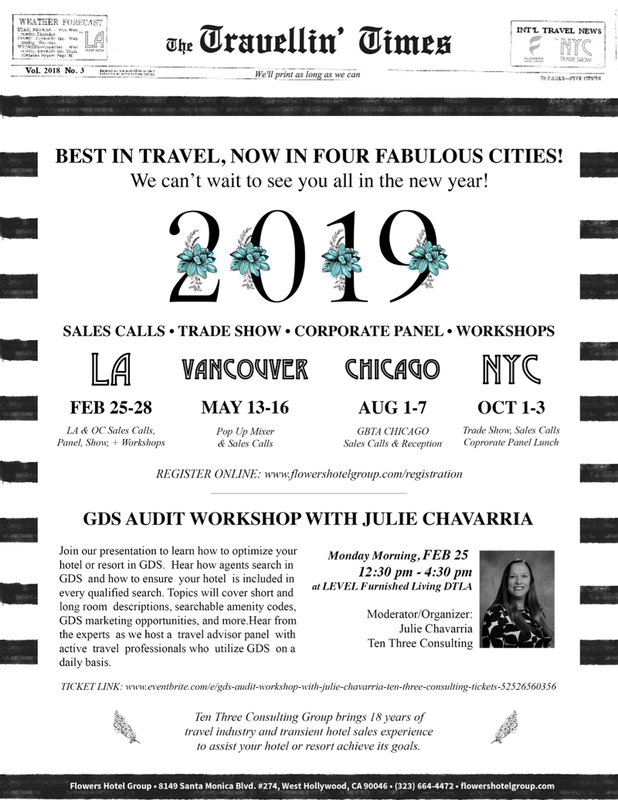 In a world of increasing uncertainty, the one thing that IS certain is that Jody Flowers and her team and The LA Trade Show and the New York Trade Show provide a professional environment in which all of us can develop and cultivate relationships that are so crucial to our business. Jody, thank you and we wish YOU continued growth, success and prosperity. Barry Podob is the Director of Sales at Le Parc Suite Hotel in West Hollywood, CA. (Pasadena, CA) – On Saturday, June 3, 2017, join Flowers Hotel Group in cooperation with ARTA for a rewarding and relaxing day of networking on the golf course for a good cause, followed immediately by a delicious dinner and exciting silent auction for participating golfers and their guests. Proceeds of the day’s activities are to benefit the animals at Wildlife Waystation. WHO: Travel & hospitality professionals, hoteliers, airlines, corporate buyers, limousine companies, and more will be in attendance. The networking possibilities are endless! WHAT: “Golfing for the Animals” Golf Tournament will benefit the animals at Wildlife Waystation, a 160 acre wildlife rescue in the Angeles National Forest. Since 1976, WW has helped more than 76,000 abused, abandoned, orphaned and injured animals, providing 24-hour care to more than 400 permanent residents. The sanctuary is funded entirely by private donations, foundation/corporate grants, bequests and animal sponsorships.